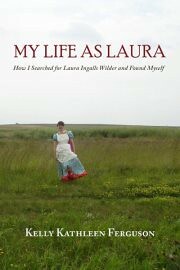 While recuperating from (very) minor surgery last week, I read Kelly Kathleen Ferguson’s My Life as Laura: How I Searched for Laura Ingalls Wilder and Found Myself, which was just published by Press 53. Hilariously realistic and sincere, it was a great book to read while stuck at home and feeling kind of miserable. I thoroughly enjoyed it. Part of that enjoyment was no doubt due to the fact that I know Kelly and really like her. She took my graduate seminar on Laurence Sterne’s Tristram Shandy two springs ago. Throughout that class, which wasn’t anything near the quality I would have liked due to the commitments of my day job (being an administrator doesn’t really leave one a lot of time to prep a grad course! ), I was grateful for Kelly’s contributions and insights. Her easy, self-deprecating humor was a pleasant mask for her genuine insights into Sterne’s masterpiece. Whatever my students got out of that class was entirely due to their own efforts and participation in the seminar’s discussion. Kelly was a key part of that. My memories of the 1970s revolve around a few touchstones: listening to my favorite records (The Crickets’ “The Lion Sleeps Tonight,” Marie Osmond’s “Paper Roses,” and Elton John’s “Benny and the Jets”), playing with my cousins, who lived around the corner, and watching my favorite TV shows: Little House on the Prairie and The Waltons and reruns of The Brady Bunch and Zorro. In hindsight, I admit that he first two were largely chosen by my mother; the latter two were my actual favs. This is to say that, while I haven’t ever read the books, I remember the series of LHotP quite well. Indeed, Matthew Laborteaux as Albert was one of my early crushes. (I also liked Jonathan Gilbert as Willie Oleson, Dean Butler as Almanzo, and Merlin Olsen as Jonathan Garvey — I’ve always had eclectic taste in men!) So, I was especially interested when PJ, who read it before me, told me that Kelly HATES the series because of the many liberties it took with the original books. Growing up with the series as I did, I had never entertained the idea that someone might not think it was great too! This was an interesting hook that got me curious about the rest of the memoir. As Kelly, dressed in a faux Laura Ingalls Wilder prairie dress, drives around the Plains states comparing her life to that of LIW, she provides her readers with honesty, insight, and humor not only about herself but about literature, television, pop culture, relationships, and what it means to suddenly find oneself at middle age. Again, I found that her self-deprecating humor serves as a vehicle for her cultural criticism, allowing the reader to agree (or not) while increasingly becoming as attached to Kelly-as-Laura and Kelly is attached to Laura. I also learned a lot by reading this book. Unlike some memoirs, this book isn’t just about the author. Instead, Kelly gives us a thorough sense of place. As she visits each town or LIW site, she describes it in rich detail and places the events that happened there (in LIW’s life) in historical context. Consequently, we learn a lot about what it meant to be a pioneer in the 19th century. (It sucked.) We also learn about LIW’s life after the books as well as her family’s activities later in life. All in all, I think the humor, insight, and contexts combine to make this book as pleasurable for readers who don’t know Kelly as it was for me. I hope it finds a lot of success, and I look forward to reading more of Kelly’s work. I highly recommend My Life as Laura.